Khilola Turaeva is the Regional Head of Trade Risk Distribution, Global Transaction Services (GTS), for Europe, the Middle East and Africa (EMEA) at Bank of America Merrill Lynch and is currently based in London. Khilola is responsible for managing and developing the Trade Risk Distribution activity across the EMEA region to support the trade finance origination efforts by facilitating the buying and selling of trade related FI and Corporate risk. 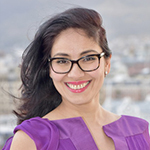 Prior to joining Bank of America Merrill Lynch in 2011, Khilola spent 7 years at ABN AMRO and RBS, based in Tashkent and London. During that time she was responsible for a number of areas within the Trade business, including Trade Asset Management and Head of Trade Advisory Operations. She started her career in Asaka Bank in 1997 in her home country Uzbekistan where she held different managerial roles in Trade Finance and Transaction Banking.